Hey folks I'm reviving my genealogy hobby at least for a while. Sorry for the lack of posts lately. As many of you know, I am a big iPhone and Mac fan. I've been using MacFamilyTree for a few years now. This is my grandfather, Leonard Daniel Lonzo Frakes above. 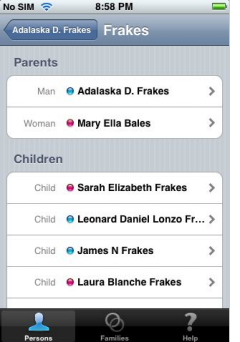 MobileFamilyTree is a new iPhone application available for $5. Price is right! It does require that you have MacFamilyTree 5 to run so I had to pay $25 to upgrade. I'm very impressed with MacFamilyTree 5. They started very ambitious and are now full-featured with all sorts of cool Cocoa based functionality. The application looks absolutely gorgeous! It is fun to use which is going to draw me back to *play* with my family tree. First up is to use my big iPhoto collection to illustrate my family tree with lots of photos. There's a plus button to add photos and you can choose select things from a media viewer of iPhoto content. You can browse through your albums and get good stuff. What drives me to put these photos in is my anticipation of showing them to family members. Photos make all the difference when looking at otherwise sort of dry genealogy data. After getting all enthused about the photos and ease of putting them in my family tree, I was disappointed that MobileFamilyTree for iPhone doesn't support photos -- yet. They have to do it. The iPhone has a built-in camera! Lots of apps use the camera. Besides that it has wonderful photo browsing capabilities and syncs with iPhoto. I want to hang around and idly play with my family tree on my iPhone while sitting in a doctors office waiting and pick photos and place them in my family tree. Gotta have it. I'm still disappointed in the MobileFamilyTree because it pales in comparison to MacFamilyTree. It is VERY basic and does let you see your data. It just has no glitz except that which you get in an iPhone App. Gotta have more. I know it is difficult to put a lot of functionality into an iPhone app without ruining it so I'm guessing they are being slow in adding features to avoid making it too complicated and cumbersome. One great thing about this dynamic duo is that you can sync wirelessly!!! 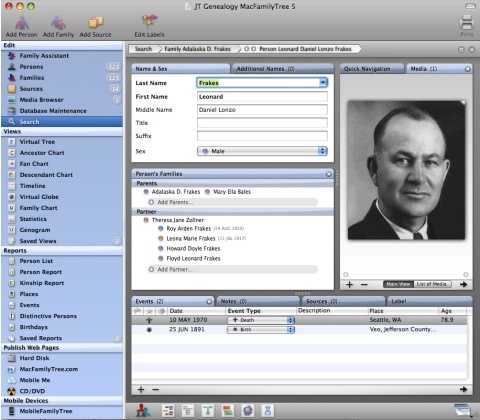 Just open up your family tree on your Mac and then startup MobileFamilyTree on your iPhone or iPod touch. Select MobileFamilyTree and in moments your iPhone or touch will be found and be ready to sync. Right now since photos aren't involved the sync is 10 seconds or something. I'm happy to wait a couple minutes to get the photos in there Synium! When I had my Treo 650 I used a Palm app for genealogy all the time. It is called My Roots. Loved it. Very good app for its day. It is VERY handy to be able to take your family tree and genealogy capture device around with you when visiting family who may have stories, data and photos to share.